UPDATE: Sen. Donnelly (D-IN) is a "no" vote. Flake is a "yes." When asked about the status of Murkowski and Collins, our Senate insider source said everything was fine in the GOP's backyard. We still have the votes. UPDATE II: Well, Sen. Jeff Flake (R-AZ), who pledged his support for the Kavanaugh nomination, decided to stab his party in the back by pushing for a weeklong delay prior to the final vote in order for the FBI to do an investigation. Manchin, Collins, and Murkowski have all backed this delay, which isn’t the same as a declaration of opposition. While Sen. Joe Donnelly (D-IN) announced he was a “no” vote, he was never included in the batch of senators who were solid on this nomination. It’s a serious hiccup. It certainly can lead to more antics from the Left. It gives them breathing room. It gives them more oxygen for this smear campaign to continue. Bravo, Jeff Flake. You’ve become the Democrats’ favorite Republican today. Maybe we should have expected this; I was hoping for no more foul ups. Never wish for anything in politics I guess. Senate Republican leaders agreed Friday to reopen the FBI background investigation of Judge Brett M. Kavanaugh after two key Republicans suggested they would not vote to confirm him to the Supreme Court without additional information on his alleged sexual misconduct while he was a teenager. The announcement followed a vote along party lines by the Senate Judiciary Committee to advance Kavanaugh’s nomination, after securing a vote from Sen. Jeff Flake (R-Ariz.), who asked for a delay of up to a week before the full Senate decides the judge’s fate. Another senator considered a swing vote on the floor, Lisa Murkowski (R-Alaska), said she agrees with Flake, leaving GOP leaders little choice but to slow down the process, given their slim 51-49 margin in the chamber. Republican leaders said they still plan to move ahead with a procedural vote on Kavanaugh’s nomination on Saturday but will postpone a final vote on his confirmation that they had hoped would take place Tuesday. Sen. Cornyn confirmed that a supplemental FBI investigation will be conducted on a weeklong timeline. The Senate Judiciary Committee still voted on a 11-10 party line vote to advance the Kavanaugh nomination to the Senate floor. 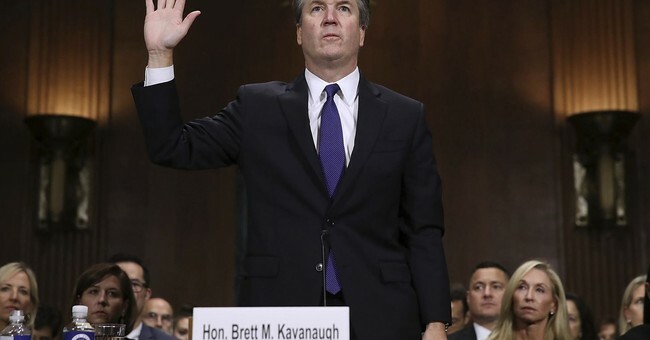 With no evidence, no corroborating witnesses, and the timing of the allegation, these allegations against an eminently qualified judge were just too thin to stop the Kavanaugh train. Remember Sen. Dianne Feinstein’s (D-CA) office had Ford’s letter since July. They sat on it for weeks. They kept it from Senate colleagues. And then they dropped it at the 11th hour in the hope of derailing the nomination. It was a Hail Mary pass—and it failed miserably. It looks like their efforts to kill the Kavanaugh nomination turned out to be a bomb that went off in their faces after all. Once again: we win, and the Democrats lose, which means it’s a great day for America. Justice Kavanaugh is another move Making America Great Again.